Carstairs is an ancient place with a village green on which sheep used to be allowed to graze. 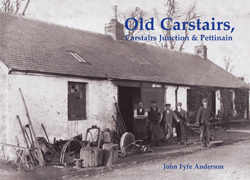 Carstairs Junction owes its origins to the Caledonian Railway which arrived in the 1840s and built a station and a junction on the main line north and south around which a village then grew. The book includes no less than 18 railway images, but by contrast featues the nearby tranquil villages of Carstairs and Pettinain.